What is a traditional sailing vessel ? Traditional sailing boats typically use blocks and tackles rather than winches. Instead of aluminum and modern carbon materials to create towering masts, they often have mainmasts and topmasts carved from solid trees. Gaff rigged sloops have very complex rigs (sail arrangement) which maximizes their sail area using bowsprits, gaff spars and booms that extend beyond the bow and transom of the boat. 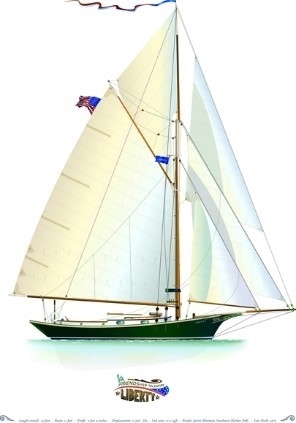 Liberty is rigged with a gaff mainsail, with a huge Douglas fir mast and boom, which were harvested from the forests of Mt Desert Island, Maine. As recently as 1920, most of the U.S. commercial fishing and merchant fleet was propelled by wind. Within three decades, however, economic changes created strong incentives for fishermen and schooner owners to abandon their sailing heritage. As vessels became costlier, transit speeds and fuel had to increase to minimize unproductive travel time. The age of sail was over, and working sailing vessels were abandoned.